Giraf is a wheeled self-cleaner with low noise (70 dB/1m) designed for exhausting, filtering and cleaning air polluted by organic and basic compounds, amino vapours, ammonia, epoxies, ozone, acid vapours, small amount of non-toxic dusts and other elements, by recycling air in the environment. 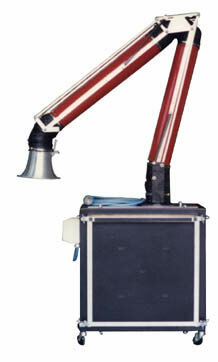 The air which needs treating is carried inside the self-cleaner by means of a fan unit specifically scantled. A selective and progressive filtering system allows excellent cleaning. Dust and particulate removal is obtained by means of washable fabric filters on two different levels. The removal of organic and/or basic vapours and gases is obtained through two different active carbon stages: the absorption and the chemi-absorption stage.